For the last couple of days, there have been major events in Wisconsin involving state government legislation intended to curtail public sector union entitlements in order to save money. Like several other states, Wisconsin faces a deep economic crisis and needs to save money and cut spending any way it can. The newly installed Republican Governor, Scott Walker, has said that anyone who didn’t see this huge budget crunch coming must have been in a “coma”. He’s recently set forth a new budget plan with big spending cuts, including what gets spent on public sector unions. Needless to say, the unions are livid, and have taken to the streets. Wisconsin public employees have crowded into the state capitol to protest the government’s plan to curtail their right to collective bargaining. Teachers, prison guards and others say a Republican-sponsored bill would severely cut into their incomes. In Madison, the capital city of the mid-western state, the Republican-led legislature on Thursday was set to pass a bill pushed by Republican Governor Scott Walker that has been described by commentators as the most aggressive anti-union law in the nation. The bill would eliminate most public workers’ collective bargaining rights and dramatically increase the amount they must contribute to their pensions and health insurance coverage. Currently most state employees pay nothing toward their pensions and only a modest amount for their insurance. Yeah, I suppose having to pay a little something when you’ve been paying zero might seem “dramatic”. But that’s the union perspective the BBC is presenting, and not an objective fact. The use of emotional language here is advocacy behavior and not journalism. And what about the claim that the bill will “eliminate most” bargaining rights? Unions still could represent workers, but could not seek pay increases above those pegged to the Consumer Price Index unless approved by a public referendum. Unions also could not force employees to pay dues and would have to hold annual votes to stay organized. In exchange for bearing more costs and losing bargaining leverage, public employees were promised no furloughs or layoffs. Walker has threatened to order layoffs of up to 6,000 state workers if the measure does not pass. Instead of reporting (or, hell, even copying and pasting from the wire service) objectively, the BBC uses the emotional language of union talking propaganda, quite dramatically misrepresenting reality. With teachers – and some students – massing in Madison to protest, dozens of schools were shut on Wednesday and Thursday. Hundreds of protesters spent Wednesday night in the rotunda of the state capitol building. Police officers stood guard outside Mr Walker’s office as angry protesters stood outside shouting for his recall from office. How did the students get there? Aren’t they supposed to be in school? Well, no, because the teachers’ union closed schools for the day and bused the students in for the cause (video proof here). How angry were the protesters, BBC? Angry workers also surrounded Mr Walker’s family home this week, the New York Times reported. How did they find out his address? Simple: the unions gave it out and sent their workers to harass the man’s family. They also went to the home of the Republican Speaker of the House in Wisconsin. Yet the BBC wouldn’t dream of frowning at this behavior in the way they did at the Tea Party protests. Quite a contrast. No suggestion of violence or dark forces behind it all. Police in Madison, Wisconsin, estimated that 20,000 people rallied at the capital on Wednesday. And that’s it from the BBC. Here’s a video of these heroic people. Guess to whom they’re comparing the Governor of Wisconsin? How about it, BBC? Any thoughts? 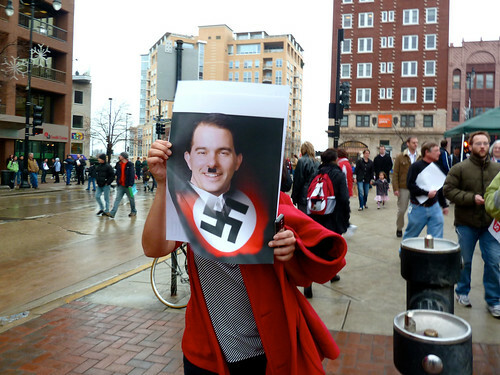 You guys were oh, so critical when the odd Tea Party protester had a similar poster about The Obamessiah. What do you say now? Nothing, of course. Moving on….. But Republicans, who were handed election victories in November in Wisconsin, say they have a mandate to cut government spending. They say that despite the protests, voters approve of the cuts, which the Republicans say are needed to balance the state budget and avoid job losses. In sum: Biased in favor of the unions, use of emotional language which favors one side, censoring or misrepresenting of facts which harms the unions’ position. Don’t trust the BBC on US issues, or issues involving unions. Nice one DP. Typical example of BBC double standards – depends which side of the political divide is protesting. Sorry about that. Thanks, fixed now. Yes, I thought Obama had said that he wanted to see less rancour and more civility in public discourse. Obviously too many big words in that particular message for his Democrat chums to understand. I was listening to Mark Levin the other day, when this protest in Wisconsin was raised by a teacher calling in from Wisconsin. Mark knows his stuff, and managed to expose the fact that the teacher’s equalised annual pay (after extensive summer holidays and generous free social benefits were added in) came to over $100,000 per annum. Even the teacher who had called in to make a complaint had pause to reflect that that this was a very generous package, compared to the private sector that was losing jobs left right and centre. Slightly off topic, but did anyone pick up on the statement on tv recently regarding Mr Assange; he refused to give an interview to the bbc? haha, I actually punched the air when I heard it. Here’s a man; like him or not; who knows this pile of excrement for what they are. Assange has had a falling out with the Guardian. It’s only natural that he would wish to boycott the Guardian’s broadcasting arm as well. More videos at Big Government. Are you an American left-winger using Nazi/Hitler imagery to demonise Republican opponents? Here, have a BBC Free Pass – guarantees that the British Broadcasting Corporation won’t ever mention it. reporting. I think you’ve forced them to change the story a little. The lead is different now, for some reason, that’s for sure. They’ve also added a bit about the Dems running away. The latter is surely just a regular update as that information came through. Nothing I’d take credit for. No wonder BBC-NUJ joins in the political propaganda for the public sector trtade unions in Wisconsin: non-contributory pensions are the utopia of the BBC-NUJ trade union branch. Inspired by their new-found comrades in the Wisconsin trade unions, expect NUJ Father of the Chapel at ‘Newsnight’ Comrade Mason (when clear of agitating for Muslim protestors of the Middle East, as on ‘Newsnight’ tonight) to be discussing another BBC-NUJ strike over pensions at the BBC soon. I wouldn’t trust the BBC on this morning’s weather. Not optimal for a national broadcasting entity that costs £4B, and which I am required to co-fund no matter what. ‘Republicans, who were handed election victories in November’ – handed victories rather than won them? What odd language the BBC uses to avoid reminding people that the Republicans are actually more popular than Democrats at present. Thanks for the post DP – this is how we have to get our info. these days, relying on good folks like yourself. In an age of 24 hour news, we seem to get less hard facts than we ever did before. We are just entrusted with doctored snippets, which are kindly “explained” to us to make them easy for peasants to understand. If winning elections doesn’t constitute having a mandate, what does? I’m a teacher in Tennessee. Our legislature is primed to pass similar legislature. Good for them. Time to give some of these incompetent teachers incentive to either do well or get out. This garbage in Wisconsin gives us all a bad name. Our job function is in our title. TEACH. Calling in sick to go join the crap-fest at the Capitol building isn’t exactly what I call a function of their job. Thankfully, we are not forced to join our union. They sure do put the pressure on, though. They tell us: “Look what we’ve done! We got you duty-free lunch!” Well, pardon my lack of enthusiasm, but how many jobs require a person to work through lunch? Seems it would be hard to get much done while eating. Our union voted to fire teachers last year so that it saves our precious step-increase. I’m all for pay increases, but you know…that extra 200.00 this year is something I could budget around for young teachers like me to keep their jobs. Who benefits here? Old, union cronies that don’t give a damn about non-tenured young professionals. Way to look out for us all. Unions today are nothing more that a way for greedy individuals to increase their pocketbooks. We pay 3% to our pension. The state matches 4%. We pay a comparable health care fee to other jobs…probably better…around 140 a month for individuals. We get Summers off, Spring Break, Winter Break, Non-government holidays. And all tax-payers ask that we do is educate their children. Well, as a group we’re doing a crap job. Sure, parents are to blame, but how many old, untouchable union-lifers are hanging on doing a terrible job? It’s no wonder people are upset with teachers. I am, too. It’s even more upsetting that these teachers are willingly leaving their children behind. If I’m a parent, I’m thinking that they put their wallets before my kid. It’s upsetting, and in case they didn’t get the memo: we have too many teachers. There are young, well-trained, hard-working teachers out there hungry to do a great job. Teachers are not the target here. Bad, union-paying teachers are, and tax-payers calling them to task scares the hell out of them. Do the NUT have a branch in Wisconsin?